Saunders recognizes the investment you have made in yourself and the graduate program education you are pursuing. That is why we make sure we have you covered every step of the way. 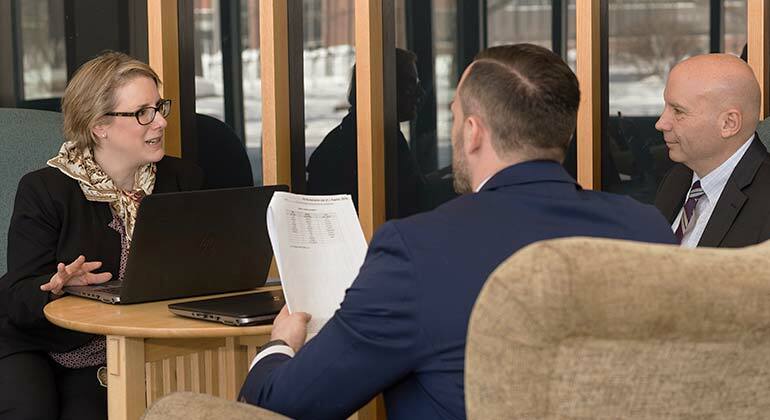 Below you will find a comprehensive team of professional that are there to guide you throughout your graduate business degree and coach you from the application process, all the way to achieving career success. Our admissions representatives are here to assist you with getting all your questions answered to help facilitate your application process and get you prepared for orientation and the start of your graduate degree experience. Our business liaison is here to assist you with all your financial aid questions. We want to be sure you are aware of and can access all the financial resources that are available to you. Throughout your academic career, from orientation to graduation, you have a dedicated academic advisor to help navigate you through all the details and ensure you remain on schedule, and on target to meet your degree program goals. Your Career Services Coordinator is your dedicated career coach, specializing in business careers across industries. It is never too early to start planning for your career goals. You are encouraged to start planning as early as possible, as you begin your degree program. In our digital age, there has never been more resources for students to tap into when working on homework, class projects, or activities outside the classroom. Visit the RIT InfoGuides to connect with your dedicated librarian today. With over 200 RIT Clubs to participate in outside of the classroom setting, Saunders is home to many clubs dedicated to business interests. Each club is supported by a faculty advisor to assist club presidents and members achieve their goals and ambitions. View all our Saunders Student Clubs, or visit RIT Campus Groups for a full listing of RIT clubs. Industry experts from corporate partners, including alumni and Advisory Boards members, contribute around the year to assist students and programs with their expertise. There are many opportunities for students to get involved to tap into this resource on the classroom, as well as outside the classroom, through events, competitions, capstone projects, and other means. The Office of Graduate Education helps all RIT faculty and graduate students succeed in their programs of study, research and creative endeavors. They also look forward to helping graduate students develop novel partnerships with the community and the private sector. Throughout the year, the office sponsors workshops on career preparation, teaching and grant writing for both students and faculty. Students for now, Alumni Forever. At graduation, you join a vast network of Saunders and RIT alumni across the globe. Your dedicated team represents a valued resource that will follow you throughout your career and beyond. Check out additional information for alumni on our MySaunders alumni resources pages.